The entrance to Pompei, the ancient city near Naples, Italy, that was partially buried by a volcanic eruption, is rather festive for such a somber location. 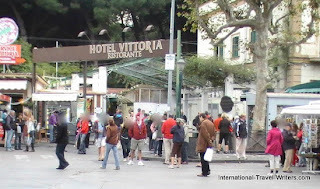 There is a fine hotel and restaurant and a well-stocked gift shop with souvenirs and replica statues. Outside is a citrus stand that has not only fresh fruit but liqueurs that are citrus based. Nearby many other souvenir stalls line the streets close to tour bus loading zones. 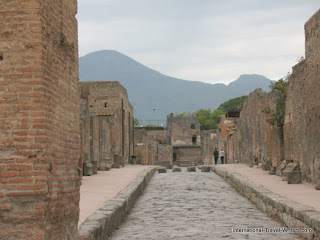 Ancient streets of Pompei are historically preserved. Pompei (European spelling has one i) evokes visions of hot, molten lava spewing down upon an unprepared city without warning. It’s this mental image of such an epic tale that attracts hordes of tourists each year, including us. We opted to tour the streets where it all happened and imagine what life had been like prior to this horrific event. A visible hint to the weather conditions that the people of ancient Pompei dealt with was stepping stones embedded in the roads to enable crossing the streets during heavy rains. The streets were well planned and were mapped in ancient times. It is with these old records that the new nameplates are placed on the streets. They also provide the physical layout for those unearthing the buried city. 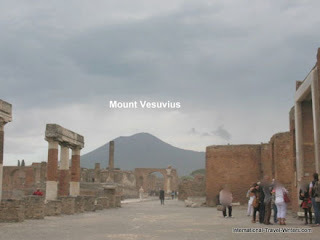 An eruption from Mount Vesuvious destroyed Pompei. The main road has elevated sidewalks that have also withstood the passage of time although in some areas eroded gnarled limestone is crumbling from centuries of rain saturation. The restoration project has attempted to retain as much of the original materials as possible. There are spots where several stone towers about 15 feet high were listing, and they now have braces to try to return them to their ramrod straight former look. Hidden in narrow side streets are less imposing but adequate structures that were homes of the less affluent. Pompei had a vibrant culture that is evident from the frescoes and other signs of amenities that existed in private villas. Public baths had ornately painted walls and even offered hot and cold water. In the outer area of the baths are macabre plaster replicas of some of the people of the city, caught in their death poses. In the 1960’s Fiorelli realized there were voids in the ash layers that he believed were the decomposed bodies. He developed a method of injecting plaster into these spaces to recreate the shapes of the victims. There are also huge public areas such as the Pompei Forum with a marble entry door still standing, a testament to the longevity of Roman structures, that led to their marketplace. This is partially seen in the right hand side of the photo. Fountains, brothels, villas and simple homes have been unearthed…shining a spotlight on the lifestyles in ancient Pompei. Excavations continue, and each year more amazing discoveries surface while the ever powerful Mt. Vesuvius still looms menacingly over the ruins.